The tension had been brewing for weeks, but when Josh Taylor and Ohara Davies finally came face to face with one another, it was something of a damp squib. Edinburgh’s Commonwealth super lightweight champion was his usual upbeat self at yesterday’s official fight press conference, whereas Davies – who holds the WBC Silver title – seemed to have forgotten his tongue as the Londoner made the journey north ahead of the duo’s clash at Glasgow’s Braehead Arena on Saturday, July 8. It’s a match-up between two undefeated fighters that is being billed ‘Bad Blood’ given the name-calling and insults that have been exchanged across social media. Both boxers are ready to put their respective titles on the line in just over five weeks time. 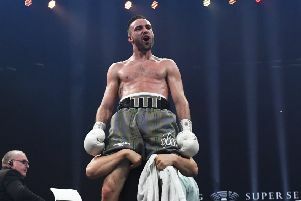 That said, you could have been forgiven for having to remind Hackney-based Davies of that as the 25-year-old seemed to care more about his image than any threat his opponent will pose. Given Davies, who wore sunglasses for the entire duration of yesterday’s press conference, has been calling Taylor out since the Scot stopped Dave Ryan to become Commonwealth champion in October, the Prestonpans star admitted he was taken aback by Davies’ reluctance to talk himself up but believes it was all just part of his act. “He just wants to be the big superstar coming in with his shades on. Firstly it was raining outside and secondly we are indoors so what’s that all about?” Taylor told the Evening News. “I took his glasses off [during the face-off], looked into his eyes and said ‘you’re getting chinned’. But even then he just stood there and said nothing. “I think he’s been told by Matchroom [Promoter Eddie Hearn] to be quiet and be respectful. The fight’s not on Sky Sports so they don’t want Channel 5 having some success. But his true personality will come out as we get closer to the fight and he’ll be back given it big licks on Twitter. It’s just the same for me, though. I am really looking forward to shutting his mouth up and bringing him down a peg or two. July’s bout will be the first time 26-year-old Taylor has boxed in Glasgow as a professional. He does, however, have fond memories having won gold at the Commonwealth Games in 2014 in what his last duel as an amateur. And, judging by the turnout at the Glasgow Marriott yesterday, it would appear Taylor has already made an impression on those boxing fans from the west. Davies’ small exchanges with the media certainly wasn’t in the script. And, try as Taylor did to entice the normally outspoken Englishman into a verbal battle, Davies maintained a cool head. “It’s good to be fighting in Glasgow in July. Josh is a good fighter but that’s why I am in this game, I don’t want to fight bums,” Davies said. “People have been saying Taylor is the man out there to beat so that’s who I want to fight. I’ve wanted this fight for some time so I believe I can beat anyone and will do the business.